Excellent quality photo books, large range of sizes, styles & backgrounds. Terrific group sharing. Easy navigation and creation process. You can stack coupons and use more than one per order. Print prices kind of high but sales are frequent. Limited products for in-store pickup. Shutterfly is one of the most popular online digital photo printing sites and it's easy to see why. The breadth of products, customization and straightforward navigation make it fun and easy to create personalized photo gifts such as books and calendars as well as photo cards, prints and much more. You can create free sharing sites, which are great for sports teams, clubs, weddings, and other events, as well as share on social media. 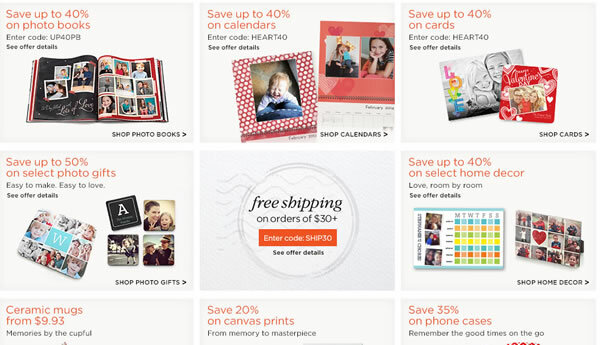 Shutterfly offers monthly coupons on photo prints and gifts. Best of all, you can use multiple coupons on the same order and save big time. For example, I bought four 8x8 photo books that would have cost me about $150. With 40% off and free shipping, I only paid $77. Free unlimited photo storage. You can back up your entire photo collection on Shutterfly. 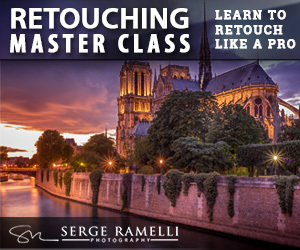 They will never delete your photos and unlike many other sites there is no yearly minimum purchase requirement. Photos stored in full resolution. 50 Free prints when you sign up as a member (also free). Custom Path Photo Books - The new Custom Path photo book offers creative control over your photo book including the ability to add, move and resize photos and text plus new styles, backgrounds, embellishments and more. You can read my review of Shutterfly Photo Books here. Free private or public sharing sites. 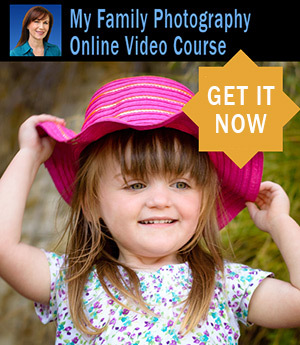 Service for photographers, web sites and organizations to sell their photos while Shutterfly handles all the details. Click here for more details about the Pro Gallery. 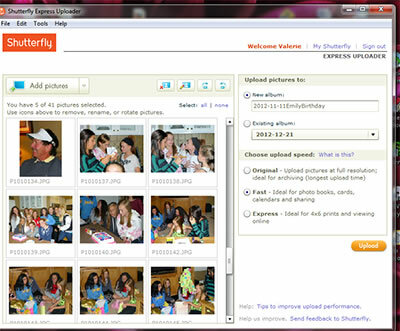 Shutterfly introduced a new way to view, organize and arrange your pictures. You can now choose from three preview sizes within an album to view pictures in larger detail so it’s easier to pick the best ones. You can also organize your albums into new folders and use drag-and-drop to arrange your pictures. You can tag your favorite photos for easy reference and sort by date taken, upload date or name. There is a new rather fun feature: from within an album, pick a photo and you can instantly preview how it would look in a variety of photo card and photo gifts. This was set up for Christmas, and hopefully it will be kept for general cards and gifts as well. 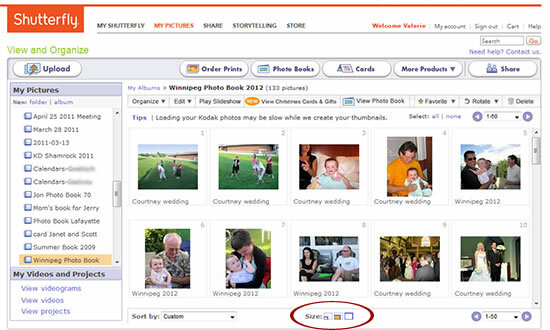 Shutterfly's organizer lets you sort and tag your favorites, reorder and move to new albums. You can view the photos within the album view in 3 different sizes so you can better select specific images. Standard print sizes: 4x6, 5x7, 8x10, wallet (4), 11x14, 16x20, 20x30. The cost for 4x6 prints is 15 cents, but you can get a pre-paid plan that can bring down the cost to 10 cents each. Shutterfly uses Fuji Crystal Archive paper and Fuji chemicals and equipment to ensure that your pictures will last for years. Their exclusive VividPics® technology automatically adjusts your photos for color. PC Magazine rated Shutterfly as Editors Choice among photo-printing services. If you have 35mm film, they'll process it, scan the photos and put them on line so you can have the benefits of digital pictures. Make a photo book of your wedding, engagement, courtship, proposal etc. 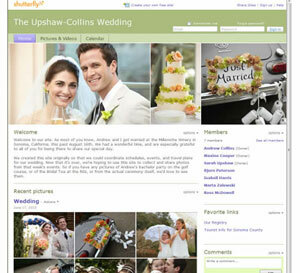 Create a free share site for your wedding to announce your engagement and collect wedding photos. Shutterfly excels at social media and photo sharing options. There is a QuickShare feature accessible from a tab at the top of the page which enables you to instantly share photos via email, Facebook and share sites. You can also share video. There is also a function to share images or whole albums on Facebook or Blogger or you can get a code and post it on another web site. You can download a free app to access all your Shutterfly albums and pictures from your iPhone. You can also create a free share site right on Shutterfly. You get a personalized web page for your pictures, videos and comments, complete with its own web address and optional password protection. Each Collection can hold multiple albums and friends can sign in and contribute their own photos and comments. Online editing tools include cropping and centering, red eye removal, automatically improve color and sharpness, add color effects including sepia and black & white, and play with borders including themes for baby and birthday. Shutterfly is one of the few photo services that allows you to add comments to each photo, such as file name and date, names of the people in the photo, etc. that will print on the back of your pictures. Download the free mobile app for iPhone and iPad. You can create and order prints and gifts using your Facebook, Instagram, iPhone and Shutterfly photos. You can also post photos to your Shutterfly account, your share site or Facebook. You can even order square prints to match your Instagrams. 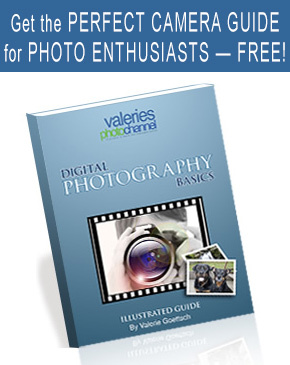 There is an extensive array of photo products you can create. The most popular are photo books, calendars and greeting cards, but there's lots more. A partial list of additional products includes iPhone cases, canvas prints, 3D wall art, mounted wall art, wall decals, personalized growth chart decals, acrylic photo blocks, ornaments, mugs, water bottles, reusable shopping bags, desktop plaques, mouse pads, magnets, photo cubes, coasters,cups, plates, desk organizers, stickers, stationery, puzzles, playing cards, keepsake boxes, jewelry, fleece and woven blankets, t-shirts, aprons, canvas totes, luggage tags, calendars, childrens picture books that can be customized with your childs photos, and much more. Unlike some other companies such as Walgreens Photo Center, products for in-store pickup are limited to 4x6, 5x7 and 8x10 prints prints and 4x8 glossy photo cards. Retail partners include Target, Walgreens and CVS and you can usually get them in an hour. However, prints are glossy only and you can't get back-of-photo printing. You cannot use pre-paid plans and prices can vary from store to store. Pick-up and payment are made at the retail store. The Expess Uploader enables you to upload images at full resolution, Fast for photo books and other creative projects or Express for 4x6 prints. The Shutterfly site is easy to navigate and upload images. Their Express Uploader, a free desktop app, uploaded 136 images that were between 2 and 6MB a piece in about 10 minutes. That's really fast! Creating digital photo albums and gifts is very easy; the site walks you through the process, so even your mom or grandmother should be able to do it without a hitch. The biggest problem I have is making a decision on which template to use, as there are numerous options for cards, photo books and calendars in particular. For this review, I ordered a number of prints from various services. My test prints came out crisp and richly colored. I have frequently printed calendars and photo books and even when some of my original images were a little dodgy, Shutterfly somehow managed to make them look better. Some people may find the prints to be a touch over saturated. In addition to their 100% satisfaction guarantee, Shutterfly has great customer support. There is live chat, email and phone support as well as a very extensive FAQ, a blog and a moderated community forum thatis veru helpful. I have contacted customer service several times and have been pleased with the quick resolution.